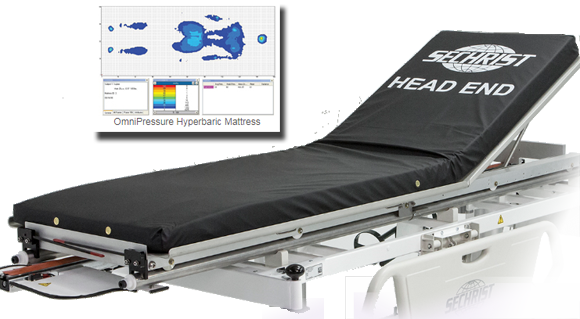 The Sechrist OmniPressure Hyperbaric Mattress provides even pressure distribution for all patients. The OmniPressure shows a 40%+ improvement in heel pressure and up to 30% improvement in the sacral region as compared to existing competitive hyperbaric mattresses (based on 165 lb., 240 lb., and 385 lb. patients). Designed to support healthcare professionals in their wound-prevention goals, the Sechrist OmniPressure Hyperbaric Chamber Mattress distributes pressure across the patient’s body for optimum comfort. A unique two-layer, multi-density design provides a combination of support and conformation, while a gentle taper at the foot of the mattress redistributes pressure along the lower legs and reduces stress on the patient’s heels, a problematic area for those with compromised wounds. The OmniPressure Hyperbaric Mattress fits all current brands and models of hyperbaric chambers and is designed for safety, flexibility and optimum infection control. The fabric cover top is both fluid-resistant and flame resistant. Specifically designed for use in a hyperbaric chamber, the cover is conductive, anti-microbial, self-deodorizing and easily cleaned. The mattress meets all standards for protection of the patient and facility. The standard OmniPressure Hyperbaric Mattress supports all patients comfortably and with optimum pressure distribution. A bariatric model is also available designed specifically to provide the same benefits to patients from 400 to 700 lbs.